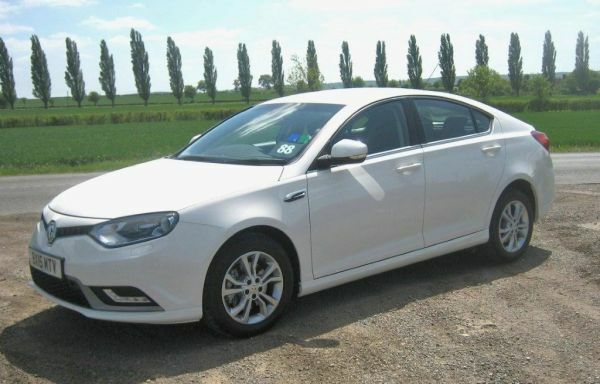 Revitalisation must be a key word in the MG Car Company’s programme if the 2015 model year version of the generous MG6 TL is anything to go by. The sleek, fast back looking 5-seat hatch back has dieted to shed some 75 kilograms and the high efficiency 1.8-litre turbo diesel engine has become cleaner, producing a tax saving 119 g/km while continuing to produce a highly flexible 149 bhp. The effect is that it is quicker off the mark with a claimed 0 to 60 mph acceleration time of a competitive 8.4 seconds, plus a claimed top speed of 120 mph and has a reported combined fuel consumption of 61.4 mpg. It is obviously not evident where the weight loss has occurred but the bonus is an upgraded interior very clearly suggesting that the product is closing in on a higher market class though retaining exceptionally attractive pricing levels. First impression of a very substantial car, the door closing with a re-assuring clunk, the overall product finish clearly up to modern standard with close shut lines to all the metal and plastic trim panels. Size wise it is perhaps similar in interior and luggage capacity to a Volkswagen Passat or Vauxhall Insignia, the head and leg space for all five occupants is generous and the luggage compartment is deep though accessed by a fairly high lower lip there are the usual 60/40 split fold seats to add to the overall practicality. An optional space-saver spare wheel is available, otherwise a puncture repair kit suffices, however, I would suggest that there is sufficient space for a full size spare wheel. As is the case with many cars that have an English ancestry, the Chinese owners of MG have not been tempted in anything retro, the octagonal MG logo badge obviously retained but it is evident that the product has moved on with the times as far as overall presentation is concerned. Importantly, there has been a lot of effort in creating a satisfactory ‘cockpit’ situation, the electrically powered front seat and fully adjustable leather clad steering wheel providing a comfortable and supportive situation for all shapes/sizes of driver and aided by good pedal positioning with a decent sized rest for the left foot. Driver vision is good and enhanced by a clear view rear camera screen that doubles up with the satellite navigation system. Powerful halogen headlights with a front cornering facility and LED auxiliary lights optimises seeing and being seen. There is only one engine available and it worked with a positive action fairly close ratio six-speed manual gearbox that complements the very eager power delivery. Yes, there is a degree of sporting character about this car. That comment also refers to the ride and handling that gained the car the Auto Express magazine 2014 Best Handling Award. The ride borders on the firm (and stable) side while the road holding and response through the steering wheel is most satisfying; what, in fact, I would expect from a modern day MG. Notably the suspension system is fully independent. Braking is by four large ventilated discs and the parking brake is an automatic electric device assisted by a hill hold system that made for easy take-off on uphill situations. A positive feeling car that certainly cruises well (cruise control is standard), easily keeps up with the cut and thrust of varying traffic speeds and also provides easy around town use with a tidy turning circle that makes for easy parking and a flexible engine that does not demand excessive use of the gear stick. A responsive Stop+Start system is a contributor to that good fuel economy and low emissions rating. Hailing from a country that is a world leader in producing electronic items I can appreciate how this MG model manages to incorporate so much modern age kit and when you add items like a cooled centre box between the front seats, dual zone automatic air conditioning, touch navigation, heated/remotely adjustable exterior mirrors, brake pad wear warning system and even an electronically controlled differential, then it is clearly evident that a major effort, and that includes a strongly competitive motor race activity, is being made to continue the MG marque as it should be. This TL test car is the top specification model and for a similar mechanical package there is an entry level version priced around the same as a mainstream medium specification small hatch back I’m greatly impressed. MAIN RIVALS: Vauxhall Insignia, VW Passat, Skoda Octavia, Toyota Avensis.